1 – On the remote control press TV then press and hold SETUP until the selected mode key blinks twice, then release SETUP. 2 – ENTER the four digit code for your device. 4 DIGIT CODES HERE – If done right the selected mode key will blink twice. 3 – If the selected mode key emits a long blink, the code is bad. Repeat the steps try entering a new 4 digit code. 4 – Point the remote control at the TV and press POWER one time. (The TV should turn off. If not repeat the steps and try new 4 digit universal remote codes for your TV brand until you find one that works. 1 – Turn on your TV. 2 – Press TV once on the remote, next press and hold SETUP until the TV key blinks twice, then release SETUP. 3 – Try entering 9-9-1. The TV key should blink twice. 5 – Press CH+ one or more times and stop when the TV turns off. When your remote is in search mode the remote control will send IR (infra red) codes from its memory to the TV, starting with the most popular code first. 1 – If while pressing CH-, and you make a mistake and pass the code, press CH- one or more time until the TV turns ON. 2 – Press SETUP once to lock in the code. The TV key will blink twice. 3 – To search for the universal remote code for your other things like receivers or DVD players, repeat the steps but substitute the key as AUX, VCR, or CABLE you are searching for. 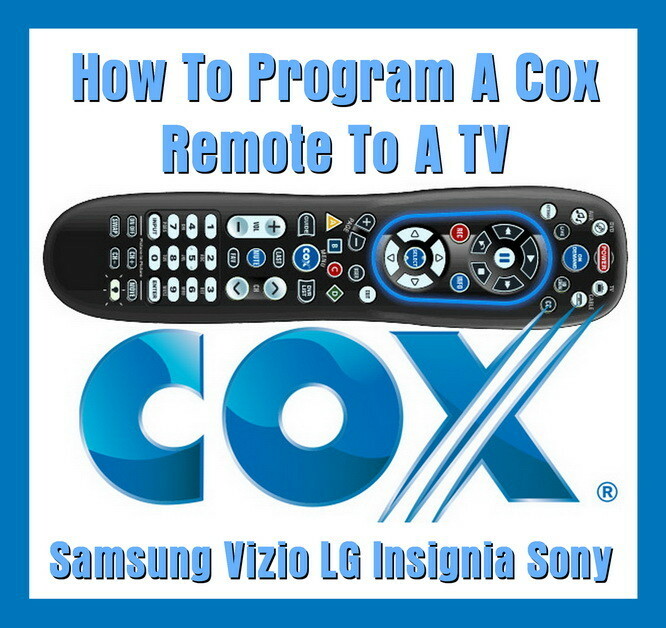 Do you have questions on programming your Cox remote to your TV? Please leave a comment below and we will assist you.